Golf is a game of cause and effect. Take a solid swing and make good contact, you should hit a good shot. If every piece of your golf swing is executed correctly, you’ll put your ball on target. Conversely, if your mechanics break down at any point, your ball ends up somewhere other than its target. I.e. when you pull out of your stance with your hips, you top the ball and it bounces fifty yards. 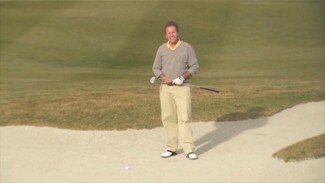 Most golfers go through funks where it seems impossible to keep a shot in the fairway. When this happens, many players will tinker with their swing and adjust their posture or move the ball in their stance trying to find an answer, but these changes could be missing the obvious breakdown in your golf swing. PGA Professional Brad Redding believes the breakdown almost always occurs in the golfer’s swing plane. To give you a better sense of what that means, the golf swing plane is explained in-depth in this video, and we give you some tips on how to realign your swing on its plane and improve your mechanics. To help you refine your swing plane and regain your most consistent swing, Brad gives a brief overview of the concept of the swing plane. He discusses how the golf swing travels along two axes: in-and-out and up-and-down. Each time you bring the club to its highest point in the backswing, your goal for the entire swing should be to stay balanced on these two axes. Try not to break the plane or stray from the club’s optimal path. All golfers can benefit from practicing their swing plane with short and long irons. WIth the gist of the golf swing plane explained, Brad shows you a simple drill you can practice in your home or at the range to develop muscle memory of the axes of your swing plane to align your swing and improve your scores. Then, he’ll explain why the swing plane doesn’t change shape dependent on the club, and demonstrate the single adjustment you’ll need to make when you switch from a wedge to a long iron and vice verse. Now that the golf swing plane has been explained and you know what to look for, you can make the correct adjustments to rediscover your swing plane and realign your swing.